It has to be said, I’m really not one for showing my legs; mostly because as you can see above, they’re consistently so pale that they blind passers by with their dazzling properties. In the photograph, they actually start to blend in with the white table, sigh.So it stands to reason then, that the ‘ankle-socks-with-everything’ trend has kind of passed me by, which is a shame because the whole ‘geek / sensible librarian’ style is one I quite like. 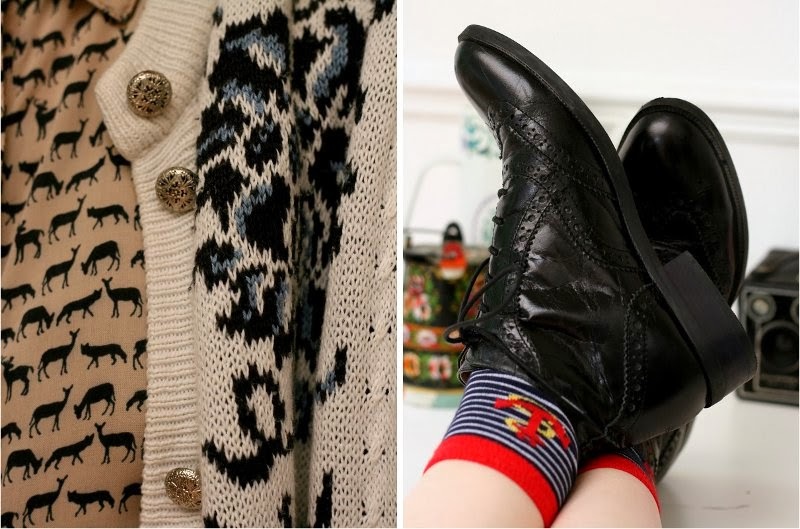 Plus, let’s be honest – socks are well comfy, especially in the colder months. So when I pulled my charity shop woollen skirt out of storage, I thought rather than sticking leggings under it like last year, I’d have a go at wearing it with my brogue boots and ankle socks. I have to be honest, with only a few inches of leg on show, I’m pretty much a convert – the weather at the moment is still pretty warm, especially for October, so I wasn’t cold, and I didn’t have to continuously keep tucking my leggings back into the tops of the boots like I usually do. Anything that saves me effort is always a winner! I’m enjoying all the layering that comes with Autumn; the stag print blouse is an eBay find from earlier this year and the cardigan came from a charity shop a few years ago. I love clashing patterns together, and thought these two worked quite nicely with each other. My beloved document case was a gift from my Mum, via a charity shop, and it’s probably my favourite bag in the entire world. Completely impractical for the school run in the rain, mind, but perfect for pretty much anything else. I feel like I should apologise for the quality of the photographs – the lighting was particularly lousy on the day I took these. The worst part of Autumn and Winter for me is the reduction in light levels – too much darkness! Your outfit is wonderful and so is your desk space behind you! Love it all – 'spesh the bag! You look AMAZING. I am loveing your recent fashion posts. All kinds of cool. Oh my, those shoes! You can definitely do the ankle socks things my dear! I really like the newly curated desk space as well – so much to look at.PS Having just logged on for a catch up I realise you've change your header too – LOVE it!! !